When we opened in 2011, the Occasional Child Care license was brand new. No outside space required, broader care perspectives, and a double-wide age range, capped at 40 per month. And ineligible for subsidy. NO EXCEPTIONS. 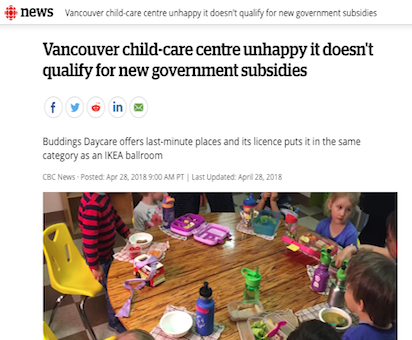 Buddings was the first centre to use the license to offer flexible booking (as reported by the CBC at the time), and possibly the first centre to offer flexible one hour's notice childcare in North America. 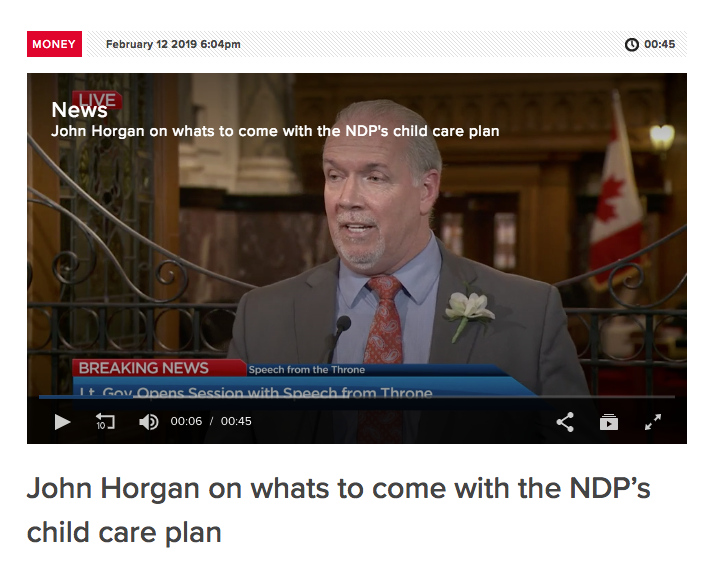 In 2018, BC elected the New Democratic Party and BC Greens to legislate the province, thanks in part to the support from families engaged by the promises for childcare reform. Premier Horgan acknowledged the need to expand care options, fund quality programs, and make them more affordable, especially for low and middle-income families. He specifically highlighted the need for "flexibility" and it's no surprise that more centres are offering our model: it's what families want! 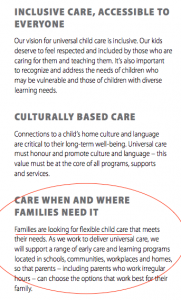 Policies in childcare are changing for the first time decades. Quality care is becoming more affordable and more accessible, and we'd like to see the promise to make it more flexible come true as well. Buddings isn't alone anymore, and more "flexible" childcare centres are popping up (we're even helping them grow 😉 ) and they serve many, many, many more families than conventional full-time centres. If the same fee relief and support were available, even more families might choose to attend flexible programs. At this time, Buddings families are not eligible for childcare subsidy or tax benefits, regardless of annual income. WE DO NOT QUALIFY FOR SUBSIDY. But if you'd like to help us change that, fill in this form and send it in... or let us do it for you! Despite the premier's promises last year to work on the problem, and our willingness to help, despite meetings last summer between Buddings and the Ministry of Children and Families, and the Childcare Minister, Katrina Chen (contact her here), we are still waiting for word. View the CBC news call-out from last April. If your family is eligible for subsidy or tax benefits (use the calculator to find out how much), and fill in the form and send a letter. Let's demonstrate how many families would be affected by government attention to this issue. The link includes more information, and you can find a copy of the letter here. We'd love to hear what response (if any) you receive, and at the very least, we will keep a count of interested families. If you'd be willing to speak to media, definitely let us know.